The winning recipe from this years Wasteless Pantry Bake Off…. Combine fruit and brandy in large bowl, cover with a lid and set aside for 2 days to macerate. Grease a 22cm cake pan and line base with a reusable tray liner or grease a spring form cake pan. Beat butter & sugar until creamy. Add eggs one at a time, beating well until combined. Stir butter & fruit mixtures together. Add flour & mixed spice. Spoon into pan and tap lightly on benchtop to release any air bubbles, arrange almonds and cherries on top. Bake at 150C covered with a bigger cake tin for 2 hours 30 mins to 3 hours. Drizzle hot cake with extra brandy. Cool thoroughly before turning out. [Store in an airtight dark container for up to 3 months]. Thanks for the cake recipe, I’m going to have a go at it, How do you think it would go with dark rum instead of brandy? 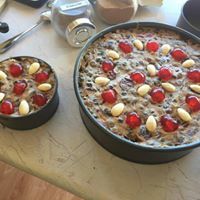 I’ve only ever made Christmas Cake twice in my lifetime but I think it would be fantastic! Let us know how it goes.